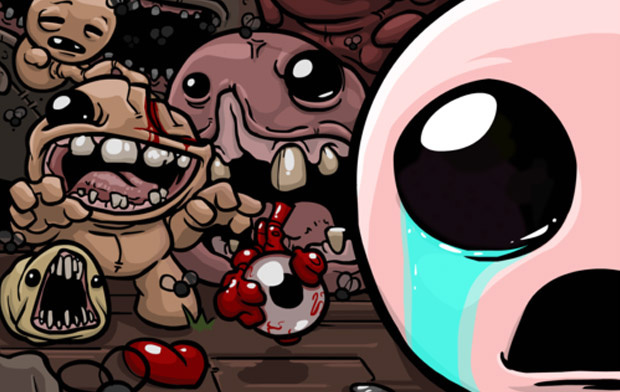 The Binding of Isaac: Rebirth will be hitting Wii U and 3DS this year, and boy has it been a long time coming. The game was teased for Nintendo systems way back in 2012, but Nintendo was initially opposed to the idea - citing the game's "questionable religious content" as the reason for blocking a possible 3DS release. In the past few years Nintendo has become more open to indies and "mature" games appearing on its console, hence the about-face and confirmation that Binding of Isaac is indeed coming. We already know that former Nintendo indie guru Dan Adelman pushed hard for the game prior to leaving the company, but according to Isaac creator Edmund McMillen, Nintendo of America boss Reggie Fils-Aime has been very vocal about his support of the title ever since 2012, the year that Nintendo issued the original rejection notice. It would seem that Reggie - along with Adelman, before he left - has done everything in his power to get the game onto Nintendo consoles. So there you have it - Isaac has a big fan within the walls of Nintendo of America, so it really was only a matter of time before it happened. Are you looking forward to playing the game? Sound off in the comments. I understand that this game is really good and worthwhile - everyone on the internet is crazy about it. But every time I look at it I just want to stop looking at it as soon as possible. Everything about this game makes me feel uncomfortable. I am too squeamish for this game. @EarthboundBenjy It is a very disturbing game but it's also a game about a survival and such.but definitly not for the young and the squeamish. I've played the game quite a bit on steam though nowhere near as much as some people. I will probably spend most of my time catching up and progressing further on the Wii U and 3DS versions. Really hope there will be a cross-buy promotion. As much as I want to support the game, buying it 3 times wouldn't be very fun for my wallet. I wouldn't say it terribly bothers me, buuuut.... eh, doesn't look like it's for me. Super Meat Boy was fun, gameplay-wise... although the premise was a little up there (same developers of Binding of Isaac if I recall). I think I'll stick to Shovel Knight. Huh. I wasn't expecting his body to be ready for this. What do you mean, he isn't opposed to releasing games with mature content on consoles with built-in parental controls? Who made this menace to society president?! I have been waiting for this game to come to a Nintendo console and now that it is I know where I will be purchasing it. I don't care much for this game. I would like to see FTL for nintendo. Great "Courage the Cowardly Dog" episode gets an game. Wait does Courage have an game already worth playing? Huh, what the heck stopped Nintendo from letting the game onto their systems until now then? Are they really THAT on a leash by NoJ? I wish Reggie was passionate about getting Super Meat Boy on the system. Well, you're the man, Reggie. @RegalSin I always thought that the episode of Courage where the guy goes around shooting depressing cannonballs would have made a fantastic game if it was fleshed out a little. It was one of the more cinematic episodes. @huxxny You should write the guys who program Terraria and ask them if they would bring Terraria to Wii-U and 3DS. See what they say. I bet they have thought about it. I don't understand all the praise this game gets. First off, it's absolutely disgusting, and don't even get me started on the iffy religious content. Reggie begs for this since 2012 (don't worry I'll still buy it) but no Dragon Quest begging? Pffftt. No I'm not looking forward to play it, I already played it years ago when it released on PC. I don't buy games again in an inferior format. The game has only been out a few months, how you played it years ago is a mystery to me- I assume a TARDIS is involved. @DarthNocturnal Yes, Super Meat Boy and Binding of Isaac are by the same developer. This is a buy for me on my 3DS. Was never really interested for this on PC, but I'm more of a handheld gamer so I should be able to finish it there. @mjc0961 FYI, I have seen it through to the very end. What gave you the impression that I never made it past the opening cutscene? IIRC, the binding of isaac's main plot.. is about a boy with an extremist christian mother that religiously tortures him in his own mind. The game looks like it's for kids, but may quickly upset and utterly disturb them upon playing the first few minutes. Certain parents would be highly against the game, and it would cause so much controversy for nintendo considering their main audience is children. Almost like a conker's bad fur day scenario, box art looks kid friend, then it's full of several controversal themes and you don't find out until spoiling it researching or playing yourself.. except binding of isaac is ALOT worse. But anyway, My thoughts on the actual game itself... where's the quote button so I can repeat exactly what @JaxonH and @KodyDawg said? I really don't feel comfortable about playing this game.. it's just not for me as a Christian. I don't mind religious iffy games, but this game litteraly is trying to convert you away from a religion.. which isn't a good thing at all for those who have their own beliefs. It's just heavily revolved around "Christians being bad" which, as a Christian, is pretty controversal and offensive. Can't wait to have this game on the go! It's a little bit of a different scenario. It's perfectly fine that people have their own beliefs, and yes, if you're offended by it, simply don't buy it. However when comparing it to other installments that use controversal topics in it, there isn't any quite like Binding of Isaac... sure, you make have a game that jokes a little about religion (Like AVGN's representation of Jesus, may be offensive, but it's harmless.. won't bother people too much, he's not trying to make people against or for christianity with it.) however it's not necessarly something you could call, harmful in any way. The difference here, is Binding of Isaac is trying to make you believe that religion is a terrible thing and harmful.. which some may agree, but it's highly offensive towards those who don't, as a direct insult rather than a passive harmless joke or one liner. There hasn't really been a game solely on the basis of anti-religion, atleast that I know of published by nintendo. Didn't know Isaac had a rating tbh, I always seen it as some unrated indie game. (Already you can tell my lack of interest in it by the lack of knowledge about it) M rating is well deserved for the gorey aspects of it. @MegaBeedrill I always saw it as the creators experience with religion (which it is) rather than trying to convert you away. Cool. This game is too gruesome for my liking, but I'm glad that the people who want to play it on Nintendo consoles will be able to. @huxxny Good news, it's been confirmed. I don't care all that much. Let me know when Reggie tries bringing Super Meat Boy to Nintendo systems. It's taken three years for Reggie to get just this one game to even be announced for Nintendo systems? Well, there's another big red flag as to why the 3rd party support is so dismal. @Tommy_Wiseau I thought this came out on steam a while back? @Platypus101 @Tommy_Wiseau I believe he's referring to the Rebirth remake of the original game, which only came out late in 2014. @BinaryFragger Reading or hearing that quote stings every time. Profound sadness. I read about this game every now and then and usually check a gameplay-video on YouTube. And I'm always thinking it looks insanely boring... And the usual piss / poo / guts content for cheap 'shock-value'... And the 'religious' stuff - does anybody besides right-wing idiots in the US really care?!? @KodyDawg same here. I will not get this game. Read the Wikipedia synopsis of the game. It's a preachy anti religion game. My BF was into playing it about a year ago or maybe a bit more. He also watched YouTube videos of others playing it. Something that I think needs to be said, this isn't people complaining about zelda or peach being rescued, or about barret in ff7, or DoA vollyball. This is a game which the whole purpose is to bash, insult, attack, and stereotype a group of people. Is this really something that should be promoted? I'd hate to see this kind of thing done about any group at all cause it just shouldn't be what games are about. And look at the comment section, we've got people bashing and acting hateful toward religious people based on stereotypes. So much for this age of tolerance. We're watching people on this site using this game as an avenue to insult and attack other people. Guys, I'm afraid the current discussion about Christianity needs to end right now. @Morpheel truth hurts, but lies are worse. But yeah, you are right. After all, this is a site about Nintendo news. It is about an kid who uses his tears to fight horror monsters in his basement. The final confrontation is with the creature that demanded his death ( which might as well be the combination of things he finds ). Basically the mother is hearing voices ( which are demonic ) and believes it is from "God". A game about an mother bent on killing her child because God told her to is kinda iffi. Everything else in the game is okay, and the story is what needs to change for it to be released. Again an character who runs around crying 24/7 and using his tears of negative sorrow he is able to fight all these horror monsters, as he throw his tears at it. Also speaking of people throwing tears, it is really something horrible to see in real life. Like when you see an grown person crys about all sorts of things, or an small child cries about all sorts of things. Many people could view this as an sort of torture or child abuse scene as well. Imagine an kid who plays this game might mimic the element of throwing tears at the parents ( thinking the tears will hurt them ). Also the game is free to play and download on your computer. So I do not really see what the big deal is. Why be an Nintendo slave, when you can turn your computer into an Entertainment system? If you ever played "Gunman proof" for the SNES it is basically the same thing. An Zelda clone that has less options. @Quorthon I'm not really offended by the game personally. I just simply won't play it, and that is all. However being "one of those stereotypes" I see how it can be offensive and controversal to a large group of players and I speak for them rather than myself. Also I don't know what your point is about that game... but for one: it's not on nintendo, a company who aims at a less mature audience, and for two: It was actually taken down from steam. Yes, it's kinda the same case with insulting a group of stereotypes, but why did that get removed, yet this game didn't for insulting Stereotypical groups? But anyway, I think I said what I had to say. We should move on from the current discussion.